Krishna Janmashtami, also known simply as Janmashtami or Gokulashtami, is an annual Hindu festival that celebrates the birth of Krishna, the eighth avatar of Vishnu. It is observed according to Hindu luni-solar calendar, on the eighth day (Ashtami) of the Krishna Paksha (dark fortnight) in the month of Shraavana of the Hindu Calendar, which overlaps with August and September of the Gregorian calendar. It is an important festival particularly to the Vaishnavism tradition of Hinduism. Dance-drama enactments of the life of Krishna according to the Bhagavata Purana (such as Rasa lila or Krishna Lila), devotional singing through the midnight when Krishna is believed to have been born, fasting (upavasa), a night vigil (jagarana), and a festival (mahotsava) on the following day are a part of the Janmashtami celebrations. It is celebrated particularly in Mathura and Brindavan, along with major Vaishnava and non-sectarian communities found in Manipur, Assam, West Bengal, Odisha, Madhya Pradesh, Rajasthan, Gujarat, Maharashtra, Karnataka, Kerala, Tamil Nadu, Andhra Pradesh and other regions. Krishna Janmashtami is followed by the festival Nandotsav, which celebrates the occasion when Nanda Baba distributed gifts to the community in honour of the birth. Krishna was the son of Devaki and Vasudeva and his birthday is celebrated by Hindus as Janmashtami, particularly those of the Vaishnavism tradition as he is considered the eighth avatar of Vishnu. Janmashtami is celebrated when Krishna is believed to have been born according to Hindu tradition, which is in Mathura, at midnight on the eighth day of Shraavana month (overlaps with August and September in the Gregorian calendar). Krishna was born in an era of chaos, persecution was rampant, freedoms were denied, evil was everywhere, and when there was a threat to his life by his uncle King Kamsa. Immediately following the birth, his father Vasudeva took Krishna across Yamuna, to foster parents in Gokul, named Nanda and Yashoda. This legend is celebrated on Janmashtami by people keeping fast, singing devotional songs of love for Krishna, and keeping a vigil into the night. 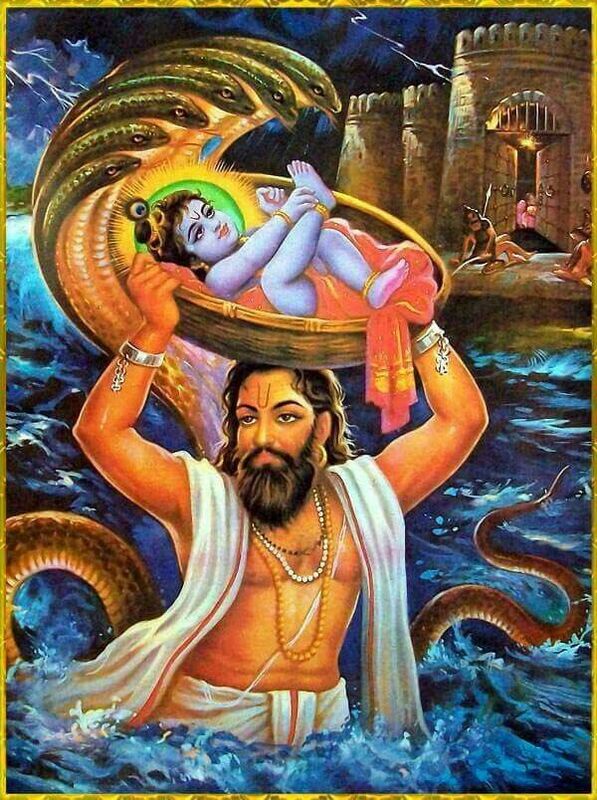 After Krishna's midnight hour birth, statues of baby Krishna are washed and clothed, then placed in a cradle. The devotees then break their fast, by sharing food and sweets. Women draw tiny foot prints outside their house doors and kitchen, walking towards their house, a symbolism for Krishna's journey into their homes. Hindus celebrate Janmashtami by fasting, singing, praying together, preparing and sharing special food, night vigils and visiting Krishna or Vishnu temples. Major Krishna temples organize recitation of Bhagavata Purana and Bhagavad Gita. Many communities organize dance-drama events called Rasa Lila or Krishna Lila. The tradition of Rasa Lila is particularly popular in Mathura region, in northeastern states of India such as Manipur and Assam, and in parts of Rajasthan and Gujarat. It is acted out by numerous teams of amateur artists, cheered on by their local communities, and these drama-dance plays begin a few days before each Janmashtami.